Today, we are celebrating one of my best friends, Joanne, she just had a baby boy whom she named James. I’m so excited for her. Her first baby, this is an exciting time for her! 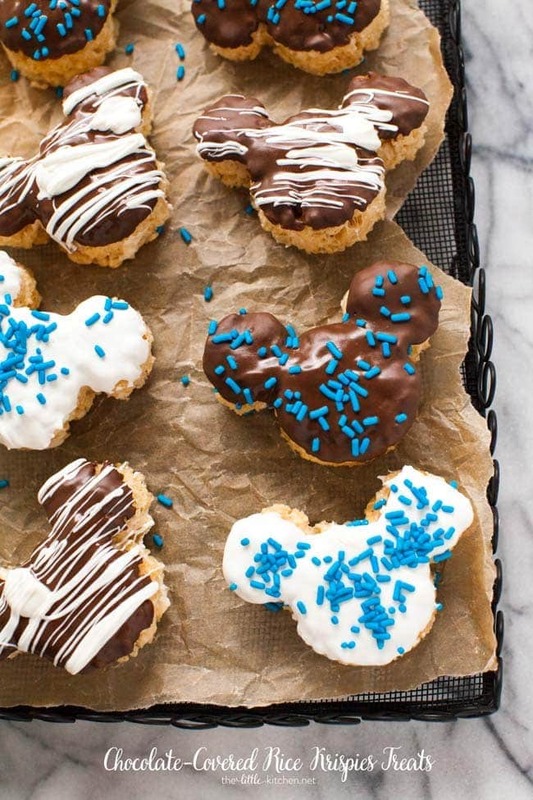 For our virtual baby shower, I made Mickey Mouse shaped chocolate-covered rice krispies treats. 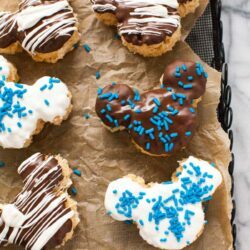 She loves Mickey Mouse and Disney World so I thought these would be perfect! Joanne had a heck of a couple of years, she had spine surgery and last year had a tumor removed from her abdomen. She literally is one of the strongest women I know. To come out of all of that and to be able to get pregnant and weather the complications she had with grace, I kept telling her, you are one strong lady! (I don’t know how she does it!) She recently shared James’ birth story. Thankfully, I just received a review copy of Cookies and Cups Cookbook by my friend Shelly in the mail! 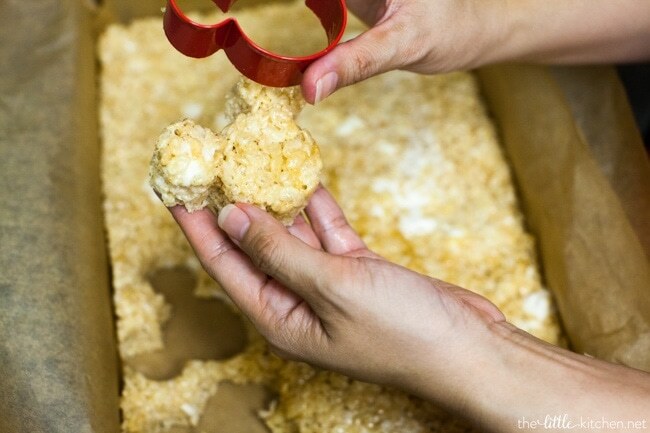 It’s a great cookbook and has tips to make the best gooey marshmallow krispies treats! First melt butter in a dutch oven (I love this one) and then melt 8 cups of the marshmallows. Once melted…they look like this…wonderful blob of marshmallows. 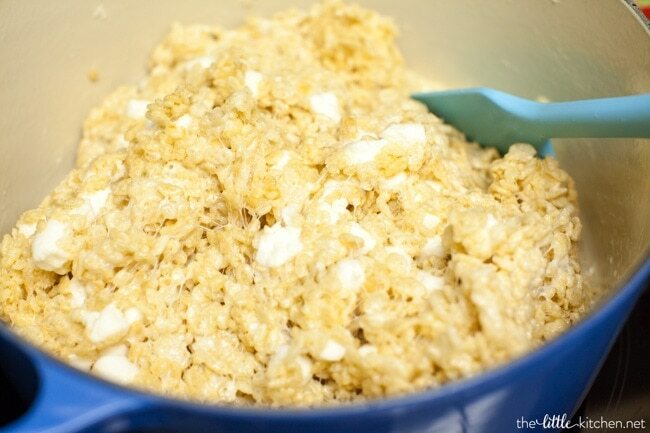 Add the cereal and mix together. Add the remaining 2 cups of marshmallows and mix a little bit. 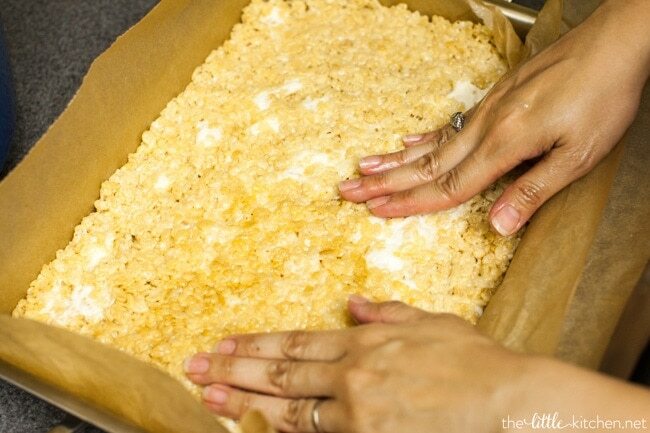 Pour the mass of of rice krispies treats into a parchment lined 9×13 pan. 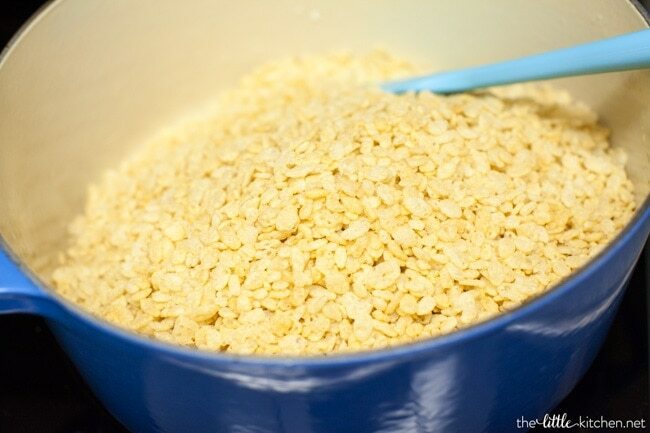 I sprayed my hands with nonstick cooking spray and use them to slowly and carefully (because the mixture is warm) press down the cereal into an even layer. Press it all the way down, until it reaches the bottom of the pan. Easy so it remains its shape. I kept saying awww how cute!!! While the treats were cooling (before I cut the shapes out), we prepped the chocolate, melt 2 cups dark chocolate melting wafers and 6 ounces white candy melts in separate bowls. Dip the treats in the chocolate however you like and we sprinkled blue sprinkles on top because Joanne had a baby boy! 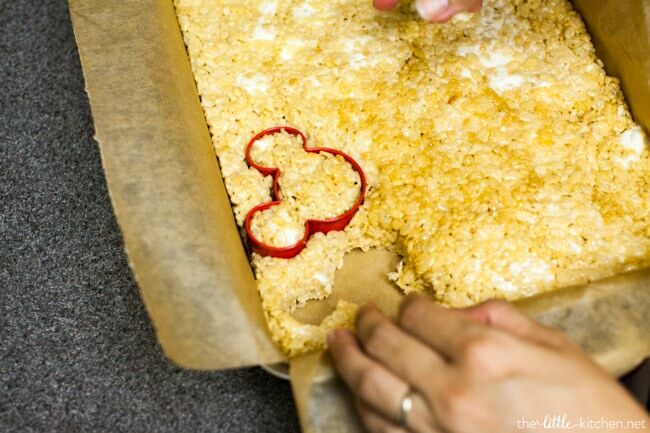 You can use whatever sprinkles and do whatever combination you want…the possibilities are endless! I love love love these!! 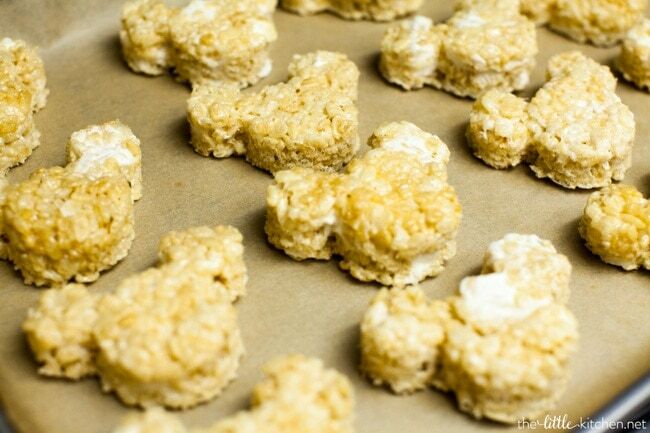 Homemade rice krispies treats are the BEST! 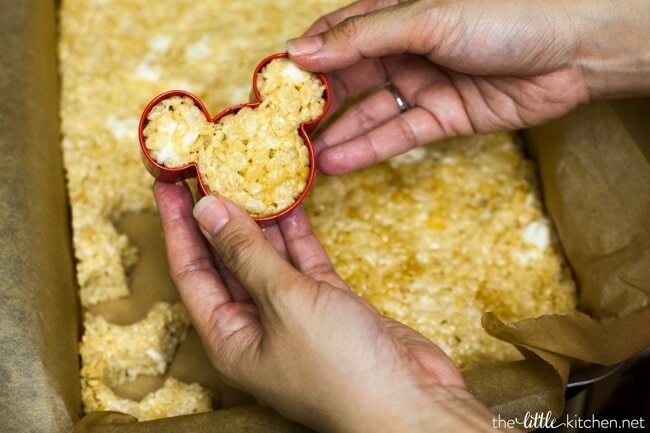 And so easy to make! 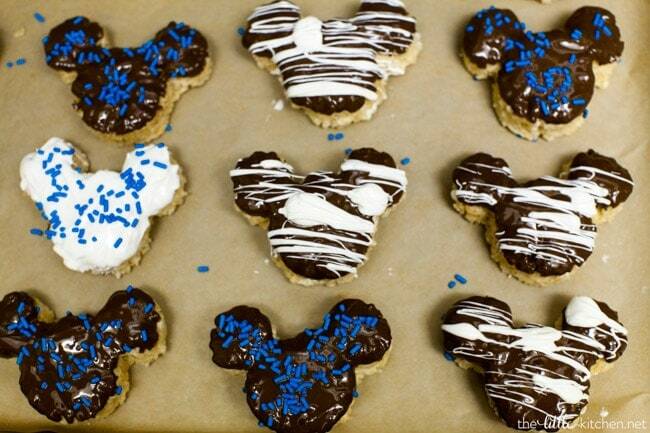 I hope Joanne enjoys these little Mickey shaped treats! Line a 9×13 pan with two sheets of parchment paper. In a dutch oven, melt butter on medium heat. 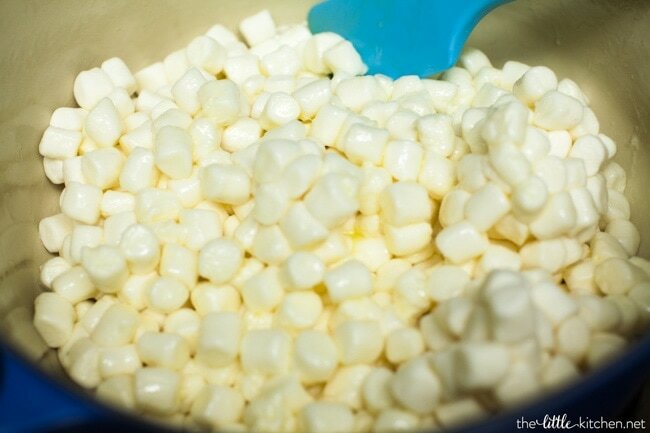 Add 8 cups of mini marshmallows, you want to stir constantly, until melted. 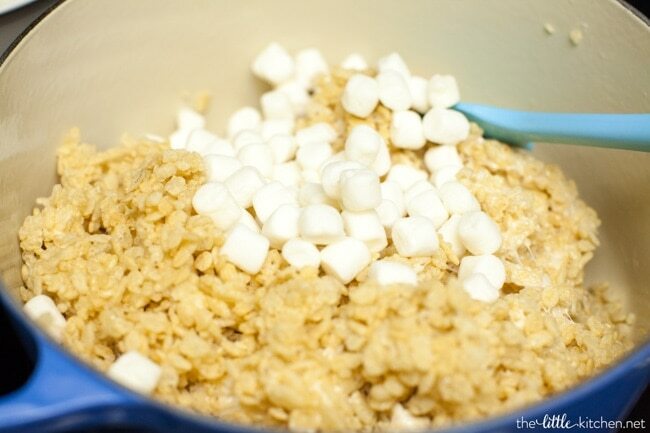 Once the marshmallows are melted, add the cereal. 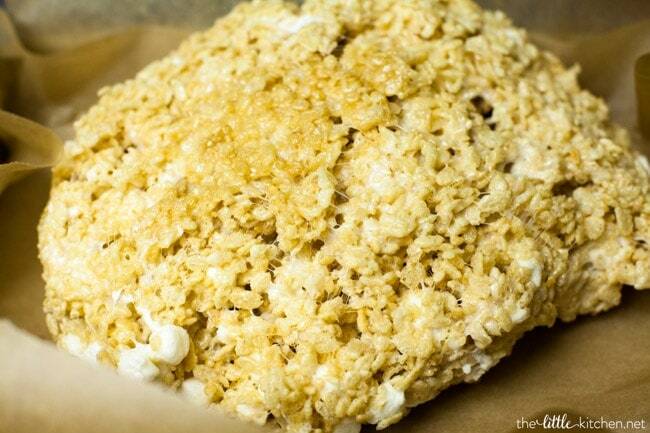 Mix with a rubber spatula, carefully to crush all of the cereal, until all of the cereal is coated in marshmallow. 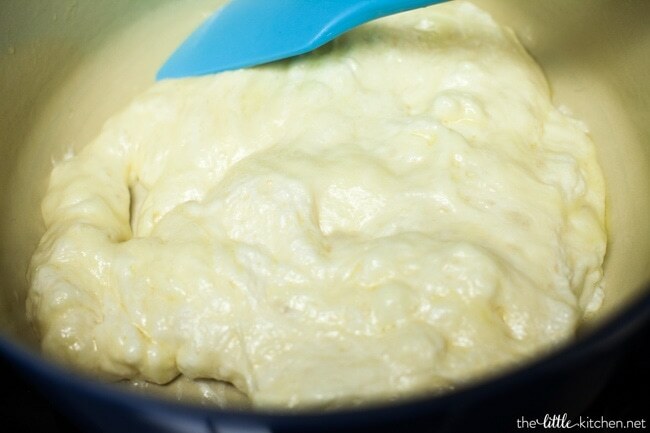 Pour the mixture into the parchment-lined pan. 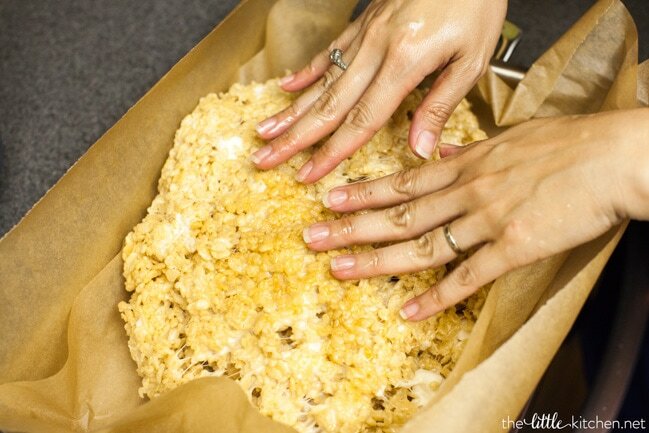 I spray my hands with the nonstick cooking spray (this works better if you can have someone else spray your hands but it’s not impossible to do yourself) and use my hands to press down the cereal mixture so there’s an even layer. 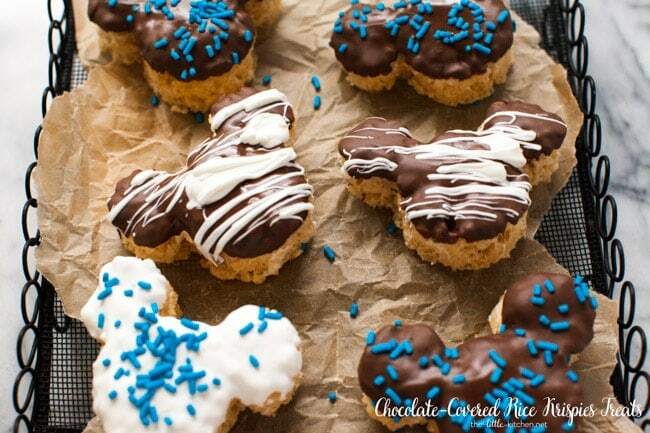 While the treats are cooling (just about 10 minutes), start melting 2 cups of dark chocolate melting wafers and half the bag of white candy melts in the microwave in separate microwave-safe bowls using the instructions given on each bag. 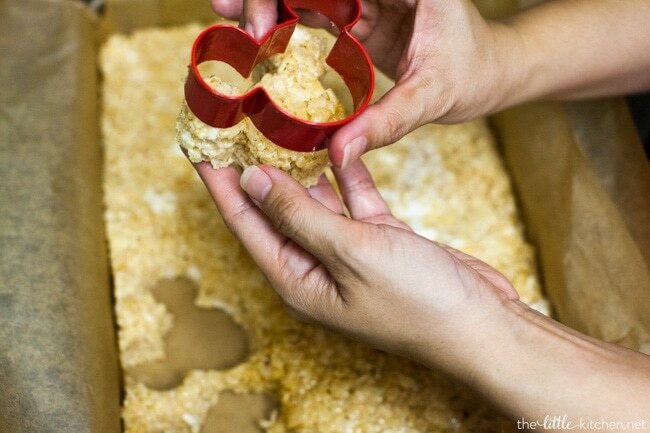 Spray your cookie cutter with nonstick cooking spray (you’ll probably need to do this a couple of times while cutting out the shapes) and press into the rice krispies treats until you reach the bottom of the pan with the cut. 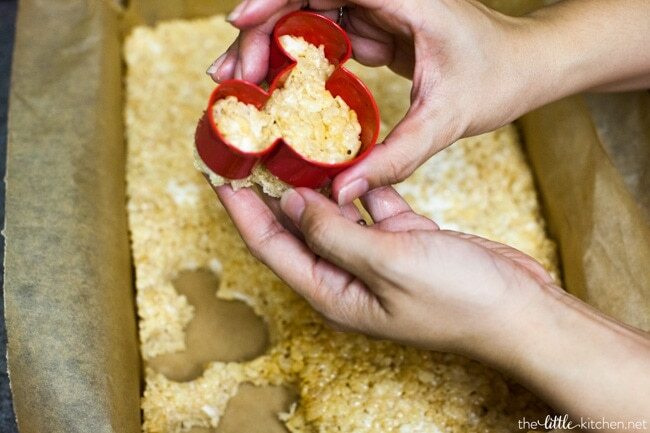 Lift the cookie cutter and carefully remove the treat from the cutter. 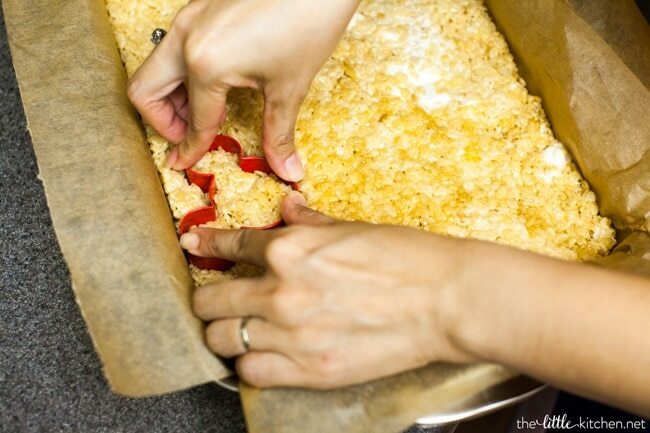 Place on a parchment paper lined cookie sheet and repeat. I was able to cut out 16 Mickeys. 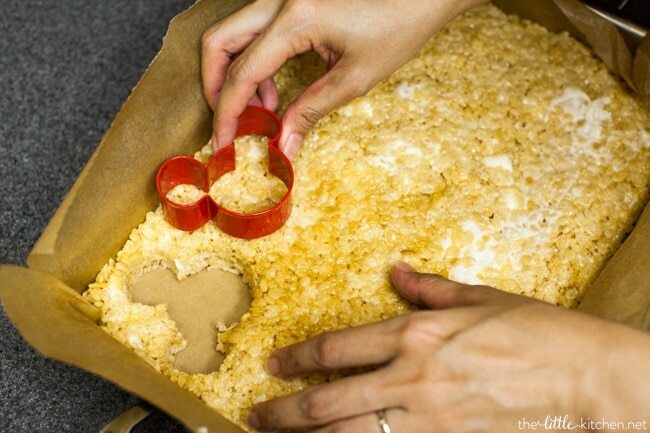 Dip each cut out shape into the chocolate or white chocolate, just about 1/8 to 1/4 inch of the way down. Lift the shape out of the chocolate and shake a little bit to remove the excess. Place back on the cookie sheet and allow the chocolate to set for a few seconds. Add sprinkles or drizzle with white or dark chocolate. Allow the chocolate to completely set before placing in a little favor bag with washi tape or serve on a try for your next party or baby shower! 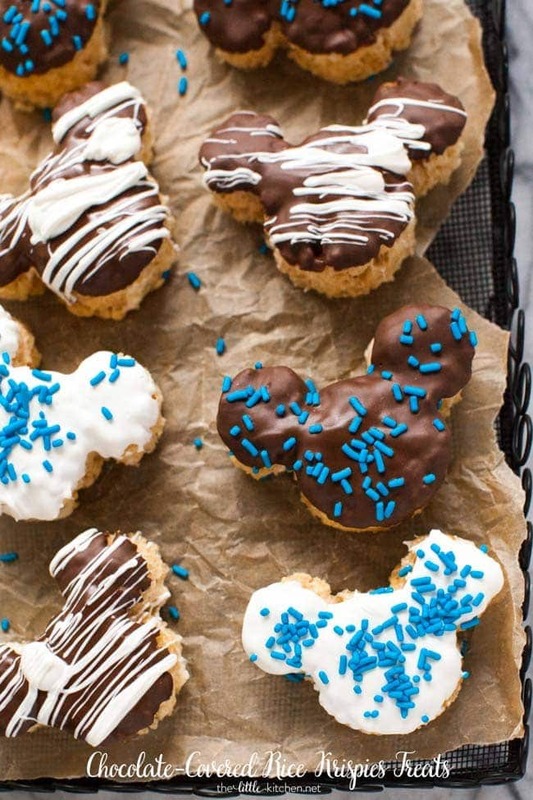 And to celebrate Joanne even more, here are amazing amazing recipes you need to check out. I’m so floored at the amount of people who came together to celebrate Joanne! Joanne, thank you for being an amazing friend…a wise beyond your years person, a special person who I’m so lucky to call my friend and congratulations to you and Pete on the birth of sweet, precious James! I can’t wait to meet him and hold him!